a house and a few outbuildings. 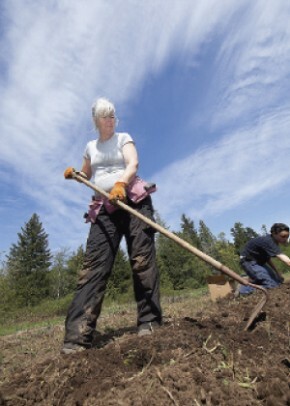 However, behind that modest exterior image lies a thriving farming operation run by Bryne and Barbara Odegard. For most of the year the farm is also home to many travellers from around the world. 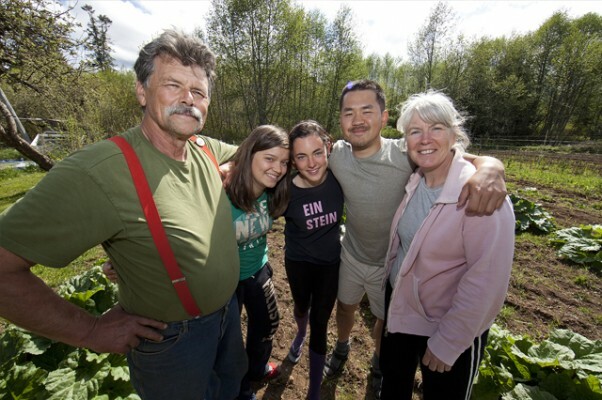 behind that modest exterior image lies a thriving farming operation run by Bryne and Barbara Odegard. For most of the year the farm is also home to many travellers from around the world. If you’re driving along Forbidden Plateau Road these days, you may have spotted the newest addition to carver Kevin Lewis’ front yard—a towering cougar come to life from a tree felled by a friend in Comox. The animal stands stretched on its hind legs, head peering over the top of the log and paws draped in front. Its tail flows down the back following the grain of the wood in a sinuous and life-like curve. In fact, the wooden animal is about the same size as an actual cougar, and if you stand beneath his gaze you might just get the sense the dangerous predator is watching you. It is a remarkable sculpture, made all the more spectacular by the fact that it was carved with a chainsaw. The cougar, though, is just one in a menagerie of real and fantastical creatures that make-up Lewis’ work and fill his front yard gallery. Dragons, fairies, turtles and bears are just a few of the things that peek out of the landscaping, and show their creator’s talent with a tool most of us have only seen used to cut things up. Granted, cutting things up is how it all started. “I started carving when I started falling trees,” says Lewis matter-of-factly. “I knew I was going to need another lifestyle. Fallers are a dying breed.” Of course, that’s only the first part of the story. His first large piece, in 1997, was a gargoyle he carved using his big falling saw. A dragon soon followed. “From then on I was hooked,” says Lewis. He invested in carving bars—fine nosed blades that allow for much better detail than a regular chainsaw blade—and never looked back. At first the carving was just a hobby, a way to bring the many fantasy worlds and creatures in Lewis’ imagination to life. Then came an opportunity to move to Newfoundland. Lewis made the decision to leave logging and make a living carving. He packed up his van, his dog and his chainsaw and drove across the country. Once in Newfoundland, he parked the van at the side of the road, got himself some driftwood and a generator, and started carving. The response from Newfoundlanders was immediate and strong. Lewis suspects it has to do with the fact that typical Newfoundland yard art includes plywood shapes and figures. “So when they saw sculptures…” says Lewis, his voice trailing off with the bemusement of someone still surprised by how successful he’s been. In Newfoundland Lewis took to carving smaller pieces, focusing on the dwarves, fairies and the mystical creatures he loves. His goal was volume and affordability. “The $80-$100 price range was my bread and butter,” says Lewis. “It kept me going. They’re so poor out there, but they’d spend that money on a small dragon for their yard.” Occasionally someone would spend several hundred dollars on larger pieces. This came in especially handy the day Lewis’ chainsaw died, leaving him to wonder how he was going to support himself if he couldn’t carve. Then there were the requests. “I had a fellow show up with a block of wood and two burls on it and he said ‘I see an ET in this boy’,” says Lewis, putting on a Newfoundland accent. “I’ve done Yodas, ETs—a bit of everything.” He was even asked to people’s homes to carve the stumps of old yard trees—something he still does today. In spite of his success in Newfoundland, and the great practice he got turning out hundreds of pieces, Lewis eventually felt the desire to come back home to the Comox Valley where he grew up. He put his chainsaw and dog back in the van, took a detour through the United States, and came back to the Island to start falling again. This isn’t to say Lewis was done with carving. Instead, the faller lifestyle—and a conscious decision to keep his bills to a minimum—let Lewis spend part of the year in the woods working and the rest of the year carving the wood he collects from his job’s reject pile, on the beach or from friends. It’s a balance that seems to work. In 2005, he used his time off to travel to Toronto to visit his cousin, a fellow chainsaw carver. Just like Newfoundland, the trip was something of an eye-opener. The two of them worked side-by-side, Lewis making his fantasy creatures and his cousin creating more typical chainsaw art: bears. 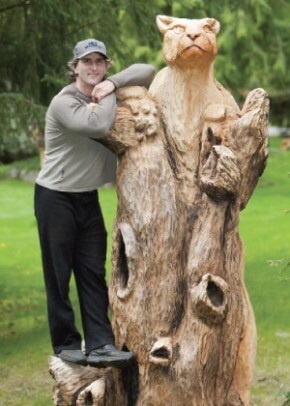 “When I started carving, I swore I would never carve a bear,” says Lewis. It was what everyone else was carving, and didn’t appeal to his fantasy tastes. Knowing this, Lewis’ cousin challenged him to a sales comparison, and when they added up their receipts Lewis had sold $6,000 in fantasy figures to his cousin’s $30,000 in bears. “So after that my cousin said you have to learn to carve a decent bear,” says Lewis with some ruefulness. Lewis did learn from his cousin, and the decision opened up his repertoire and range of buyers. One of his most popular and talked about pieces today is an octopus carved from a piece of yellow bird’s eye cedar with multiple burls, and done at a friend’s request. Photos of the piece show how Lewis matched the natural curves and fluidity of the sea animal to the curves and grain of the burls. The creature is gorgeous in its detail, right down to the abalone eyes, and looks ready to move along the ground. Instead, Lewis finds images of what he wants to do and just goes from there. “I’ll look at the pictures for the first 20 minutes of my carving,” explains Lewis. “It seems like it takes me about 20 minutes—which is one full tank of gas—of just chipping at the block of wood and then after that it’s just like I’m reading the best book ever. I start flipping the pages and the story unfolds. “And once I see that in the wood, there’s no stopping. I just go hard.” In Toronto he completed a large dragon in one 18-hour marathon session, stopping only for some food and water. He also spends a lot of time moving his hands in the air, mimicking his saw blade. That preparation shows up in the quality of Lewis’ work. Lewis is determined that every piece he does is the best he can possible do. He pours his love of fantasy and chainsaw carving into each piece. And he wants the people who buy his work to love it back. To view Kevin Lewis’ work, visit his outdoor gallery at 4010 Forbidden Plateau Road, Courtenay. Admission is by donation and tours are welcome. For more information visit his website at: kevinlewiscarvings.ca. the wooden animal is about the same size as an actual cougar, and if you stand beneath his gaze you might just get the sense the dangerous predator is watching you. the year my late father was born. The McLaughlin-Buick owned and painstakingly restored by Phil McLaren of Astra Bay, was a pure labor of love. A testament to the effort put into its restoration is that the old touring car looks like it could have rolled down the line last week, its vintage lines notwithstanding. But it is only when one takes a ride in the old car that one really appreciates its venerability and understands how far technology has moved since that year half-way through World War One. Don’t expect many hi-tech or modern innovations like a synchromesh transmission. The three-speed gearbox demands the skill of double-declutching. Disc brakes, meanwhile, were far in the future in 1916, and braking power relies on two wheel mechanical brakes applied to the massive 30-inch wooden-spoked rear wheels only. But, it was nevertheless a delightful ride I took with McLaren while I was researching this article. I wouldn’t have missed sitting up as high as I was and waving at the folks along the way who acknowledged us as we chugged through that seafront neighborhood in Comox. Needless to say the locals are not strangers to the McLaren McLaughlin. Not only is it a familiar sight in the neighborhood but also elsewhere in the Valley, where it does popular duty at graduation events bringing prom-dressed young people to their ceremonies. Brides love it, too. And it has long been a mainstay at the various parades in Valley communities. One appealing aspect of the McLaughlin-Buick for McLaren is that it is a Canadian vehicle. The company began to turn out vehicles in 1907 as the result of collaboration between Sam McLaughlin and General Motors’ William Durrant of Detroit. While it is directly tied in with General Motors’ mainstay, the regular Buick, the McLaughlin (which continued to be manufactured in Oshawa until 1942) boasted certain unique attributes, McLaren says, including the fact that considerably more wood was used in its construction. After World War Two, McLaughlin evolved into GM Canada. There was a time in which the so-called Big Three auto manufacturers produced a number of Canadian versions of the more commonplace American ones, such as the Meteor and Monarch by Ford, and the Acadian and Beaumont by GM. However, the McLaughlin was the first to boast a uniquely north of the border provenance. How did McLaren’s involvement with this venerable vehicle come about? Well, in the first place it was something of a natural for the man who was automotive instructor at Vanier Secondary throughout his teaching career. A career that saw the students in his shop turn to such projects as restoring vintage fire engines for Comox, Courtenay, Union Bay and CFB Comox. During one memorable year (1994-95) the students also produced a competition level dragster that still races and still is to be found in the Comox Valley. He notes that in gratitude for her stalwart support in his automotive endeavors he completely redid the kitchen of their Astra Bay home for her. As far as the cars go—and there has been a number of them he has completely restored over the years— the McLaughlin-Buick was the first big project to be completed. 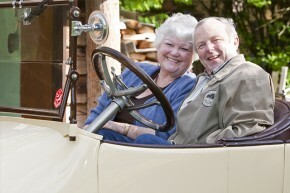 Ardie and Phil McLaren in the restored 1916 McLaughlin-Buick. The next weekend he took Ardie for a ride to see the vintage touring car, such as it was. He notes—not a man to sit around and waste time is he—that he was also building the new family home at the time. To make a long story short, he decided to acquire the old tourer and to see what he could do with it. This also marked the end of his involvement with the Whippet. He began to work on the McLaughlin-Buick in about 1977, he says, and it was finished by 1991, in time for his son Michael’s wedding. He adds that while waiting for parts to complete the big project, he also restored an MG Midget for his son, Mike. “Mike was always interested in the car restoration and it got him into his career in bodywork, which he still continues with. Shortly after the completion of the McLaughlin-Buick McLaren, with his Vanier automotive class, undertook a unique project that was right up the alley of the students of the program—the completion of the aforementioned dragster. And then there are the other cars, and the element that becomes apparent in talking to McLaren is that there is a ‘labor of love’ element in all his projects. Which brings us to the 1950 Plymouth he restored to assembly-line calibre. Yes, it was just a standard and rather prosaic ’50 Plymouth—at best never a terribly exciting car—but, there was a symbolic virtue to the vehicle for McLaren. The Plymouth, since his parents have passed on, now sits back with the next generation McLarens, in what is quaintly called the ‘Hobbit Garage’ (for good reasons, because that is just what the structure resembles), right alongside the McLaughlin. During that time he also restored a 1957 Morris Minor convertible to like-new condition. The Morris Minor is a particular favorite vehicle of his, and he currently has the hulk of one sitting at his place for which he has great plans and when completed might provide the basis for yet another story. 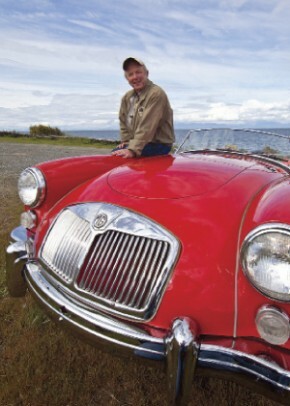 A gem of a vehicle is his 1961 MGA, and this was to commemorate his fond regard for the memory of a late colleague at Vanier, Doug Hibberd, who had originally planned to restore it before ill-health took over. He has a photo scrapbook showing the shape of the MGA at the time he acquired it from Hibberd’s widow, Margaret. It was literally a rusted hulk and he was told by others in the field that the undertaking would be too great to bring it up to even a moderately decent standard. Just the challenge he wanted. He had the car for six years before turning his hand to its restoration, and then spent a further eight years restoring it to mint condition, a process which included both repairing, filling and even turning out facsimile body parts. But in the end it was done. The final car (currently) is a 1956 Austin Healey. Ardie, he says, had always wanted a Healey and he had always wanted to restore one for her sake. Incidentally, she chose the color of the car. They are not easy cars to find, however, find one he did. The one they did find was unique in that it was produced in only the third year of Healey production. This was before Healey was powered by the big six cylinder engines of the later 3000 model. At the moment of acquiring the Healey, McLaren says he tossed up between a Healey and a Jaguar XKE. He’s happy he opted for the Healey. Next project is the one that involves the Morris Minor mentioned earlier. Needless to say, car restoration is a highly demanding and very expensive hobby. The McLaughlin, he says, because he could do so much of the work himself, cost him about $9,000 from start to finish. Many, however, demand a considerably larger outlay of money. McLaren is a past-president of Valley Vintage Wheels Car Club, an organization that has been going since the mid-1970s. As with other car clubs in the area, VVW vehicles, including some of the exotics, like McLaren’s McLaughlin-Buick and a Stanley Steamer, are regular participants in local parades and tours, as well as the annual Comox Nautical Days Car Show, which takes place this year on the BC Day long weekend. VVW can be reached at 250-338-2366. The other major restoration car club in the area is Comox Valley Classic Cruisers, which concentrates more on the hot rod genre. Find out more at cvclassiccruisers.com. This year their 25th annual Graffiti Bash and Cruise is on July 23 and the Show and Shine is happening in Downtown Courtenay July 24.